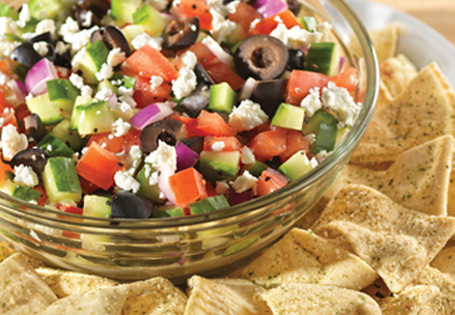 Try this layered dip instead of the usual Mexican version for your next party. Spread hummus evenly, covering the bottom of a pie plate or similar serving dish. In a medium bowl, combine tomato, cucumber, onion and olives. Season to taste with salt and pepper. Top hummus with vegetable mixture. Sprinkle with feta cheese. Drizzle generously with olive oil. Arrange pita chips around edges of plate or serve on the side.